Home Cotton candy wedding bouquets! Sure, flowers are lovely. But when there are so many alternatives to a wedding bouquet, why settle for the norm? We’ve seen people replace bundles of peonies with rescue puppies and kittens, brides clutching pizza on the big day, and men moving their floral decorations into their beards. Now the next big bouquet trend might just be candy floss. We’re all for it – a bouquet that doubles as a snack sounds like a grand idea, especially when you’re trying not to fall asleep during the vows. 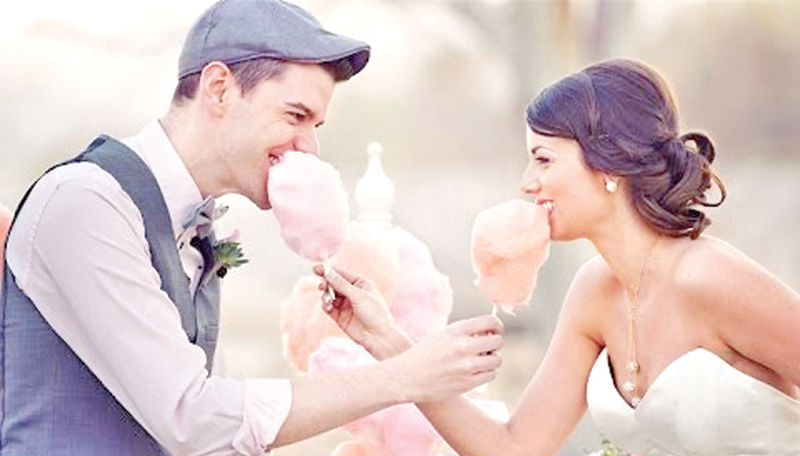 Pictures of bridal parties holding massive bits of candy floss have been popping up all over Instagram and Pinterest. We’re not surprised – that pop of pink looks pretty sweet in the wedding photos. There are a few challenges you might come up against, though, should you choose to go down the candy floss bouquet route. First, it’s best to steer clear if it’s going to rain on your wedding day. Water will dissolve that lovely bouquet into a sticky mess. Secondly, you’ll need to warn your bridesmaids not to snack on their floss until after the photos are done, unless you want wildly different bouquet sizes revealing who got peckish during their ceremony. And last of all, be warned if you intend on inviting any children to the wedding: you’ll need to have a good supply of the stuff. Any small child who sees an adult carrying sugar they can’t have will inevitably cry and cause a load of stress. Keep a candy floss machine on hand for anyone who wants a treat. Bear these things in mind, proceed with caution, and you’re golden. Do enjoy having a perfectly Pinterest-y day.